Lures catch fishermen; fishermen catch fish. That’s a true statement, and while many anglers on Florida’s Big Bend lug tackle bags and boxes holding vast numbers of lures and baits, most of them have their “go-to” lures rigged and ready to fish. Springtime flats fishing usually begins in earnest when the water temperatures get into the low ’70s and the pinfish start showing up in the 4 to 6-foot depths. With the water that “cool”, sport fish common to those depths (mostly spotted seatrout) are reluctant to expend too much energy chasing down a topwater plug or even a slow-sinking Paul Brown lure. However, a simple soft-plastic grub, pinned onto a light (1/8-ounce) jig head will work just fine. It can be cast out, let to sink to the grass tops, and slowly retrieved. Or, if YOU don’t want to expend too much energy, just stick that jig/grub combo under a noisy popping cork. Be sure to set the depth where the bait will float just above the grass, and give it a hearty “pop” every 30 seconds or so. Lure color is as important as style. The general rule is “light colors in clear water and dark colors in dark, stained water”. One of the best things about fishing with soft plastic lures is that they can be used year-round. That’s especially true as the water warms. In summer months, move them quickly and noisily through the water and in winter, slow them down. 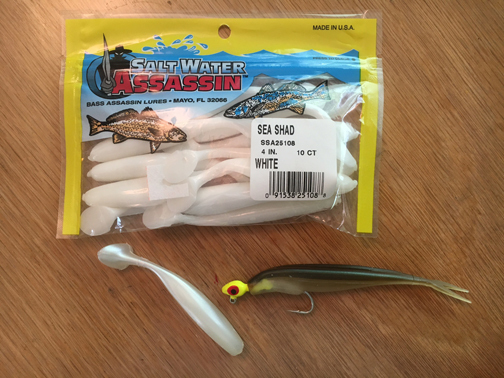 While many anglers still believe in the use of live shrimp or pinfish, others stick with soft plastics as warmer weather means that lots of live bait will be “sacrificed” to pinfish and other “junk species” (small sharks, rays, catfish, pufferfish!). While there are many “makes and models” of soft plastics on the shelves at local tackle shops, some of the most popular are made right here in Natural North Florida. One of the world’s largest manufacturers is Bass Assassin, at Mayo in Lafayette County. Their products are available all over the region–and the state.